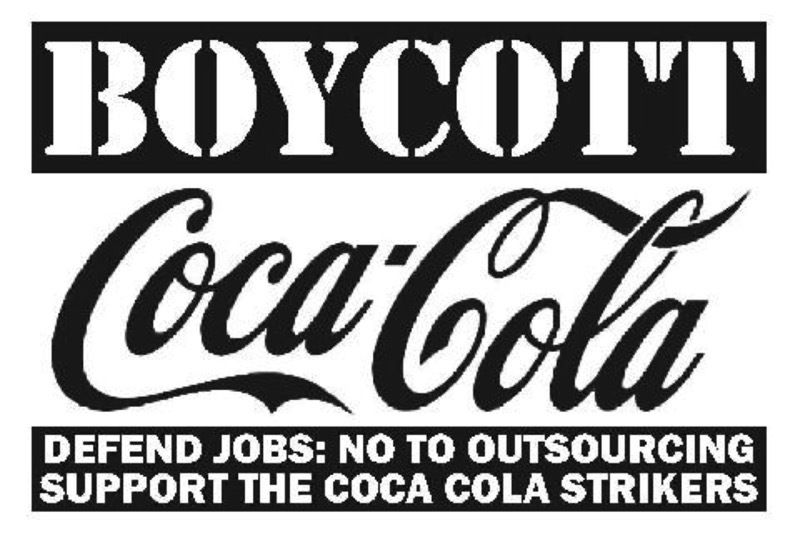 "ABOUT 2700 soft drink workers countrywide went on strike yesterday, threatening to run the country dry of Coca-Cola." "Federal regulators said today they have agreed to settle findings of hiring discrimination at the Coca-Cola Bottling Co. plant in Los Angeles. The agreement settles allegations by the Labor Department that BCI Coca-Cola engaged in hiring discrimination against African-American applicants between Jan.1 and Dec. 31, 2006." 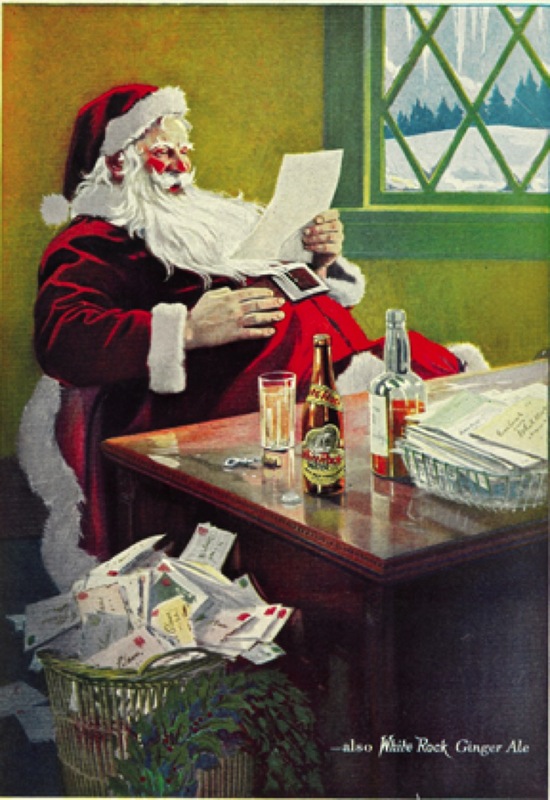 Coca-Cola's marketing produces many untrue myths: "Putting Santa in that red suit wasn't Coca-Cola's idea. You can thank American editorial cartoonist Thomas Nast for that. His depiction of Santa Claus, drawn in 1863 for Harper's Weekly created the icon children know and love today. Before then, most depictions of Santa Claus showed a tall, thin man in clothing of various colors. Nast drew him as the bearded, plump man in red known today." Coca Cola was invented in May, 1886, 23 years later. "Council supporters posted a number of anti-Coke signs on the front lawn of city hall here yesterday, calling attention, they said, to both the multinational corporation's bottled-water practices and Vancouver's contentious Olympic sign bylaw. 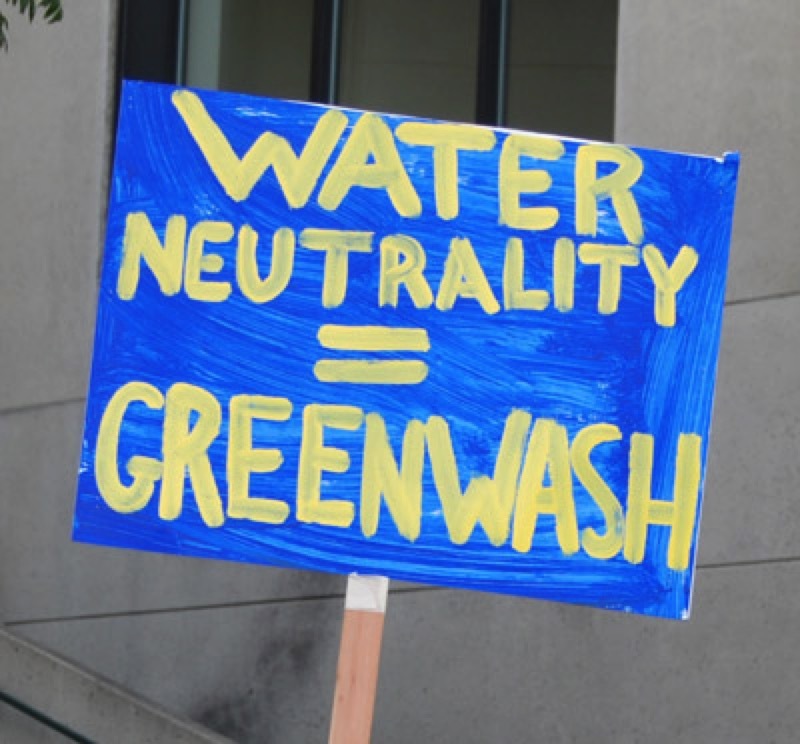 "Several hundred more signs, which proclaim 'Stop playing games with water,' are available for the public to post wherever they like, said council board member Bob Ages. 'The only way to protect our civil liberties is to exercise them.' Mr. Ages said there's no better time than the Olympics to raise issues." Amy Goodman said in introducting Vandana Shiva, "The world-renowned Indian environmental leader and thinker Vandana Shiva spoke before thousands at Saturday's protest in Copenhagen. On Sunday, I spoke with her at Klimaforum, the People's Climate Summit, and asked for her assessment of President Obama and what he represents in the climate change talks." Vandana Shiva on "Hopenhagen": "The women of Plachimada would not see hope in a Coca-Cola bottle...Coca-Cola does not bring hope and Coca-Cola should not be the symbol of finding solutions to the climate crisis." "In another major victory for the international campaign against Coca-Cola, colleges and universities in Norway have decided not to renew the exclusive contract with Coca-Cola." 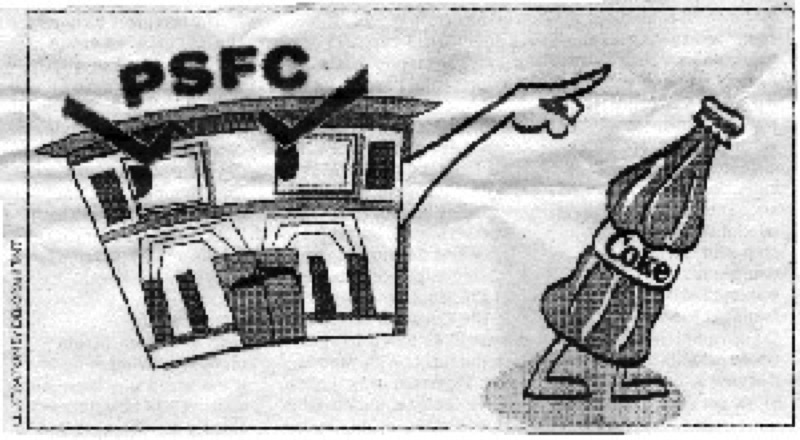 "The mood was steaming during the soft drinks debate at Monday's Welfare Council (VT) meeting. A large majority passed a resolution asking the Foundation for Student Life in Oslo (SiO) to be tougher on the Coca-Cola Company...Through a major deal with SiO, Coca-Cola Drikker AS has been given spaces for vending machines on campus and in student housing, and have also been given dominance in fizzy drinks sales at the student canteen. The basis for the suggestion from VT is the company's alleged undermining of worker's unions in Latin America, especially Colombia, and destruction of the environment in India." "Students at the University of Oslo have voted overwhelmingly to restrict the dominant presence of Coca-Cola products on campus, and introduce ethical alternatives to Coca-Cola on campus. In a resolution passed yesterday at the University of Oslo Welfare Council (Velferdstinget I Oslo), the student body will now seek to restrict significantly the size of Coca-Cola's contract, offer alternative beverages that are ethical and fair trade as well as adopt more stringent criteria for ensuring that companies that do business with the University of Oslo have strong environmental and ethical records. The student body will also inform Coca-Cola of their decision to restrict Coca-Cola, citing the company's practices in India." "*Of course, it was all white lies and fraudulence. Fraudulence! The two rebels aren't actual Coke employees. They're from the activist troupe The Yes Men. The pranktivists' explanation for the lies? That Coca-Cola's greenwashing is dishonest and its environmental impacts and labor practices unjust. Admitting this on Coca-Cola's behalf is, as The Yes Men call it, "identity correction." "We denounce before the national and international community that on 24 November 2009 our comrade Luis Javier Correa Suarez received a call on a mobile phone assigned to him by the protection programme of the Ministry of the Interior and justice, the call came for the mobile number 312-8160930 and a man who identified himself as Arnold Jimenez told Javier Correa 'you have until the 22nd to renounce, and there won't be another phone call', when he asked why the man replied 'you know why, don't play games, you know what I mean' and hanged up the phone." "In the midst of an epidemic of childhood obesity, the American Academy of Family Physicians is partnering with Coca-Cola. 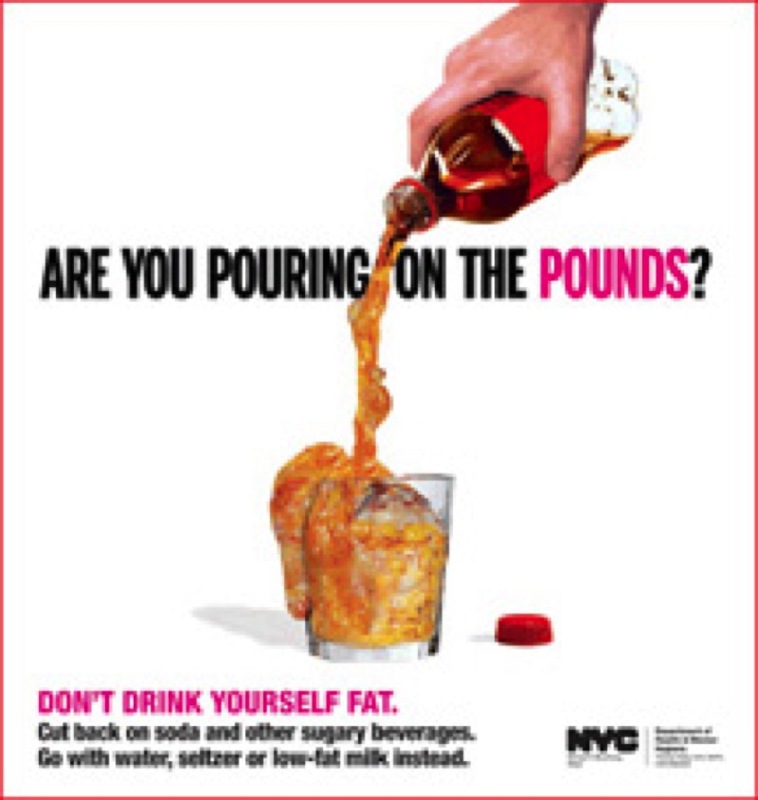 "A child's chances of becoming overweight increases by 60% for each serving of soda they consume a day. Yet the AAFP is accepting a grant from Coke--which aggressively markets its sugary beverages to children in schools and on programs like American Idol--to "educate consumers" on the AAFP's award-winning website, FamilyDoctor.org, about the role Coke products "can play in a healthy, active lifestyle." "Families need honest information about soft drinks, not sugar-coated corporate spin. That's why a number of prominent physicians have already resigned from the AAFP in protest. "Please tell the AAFP that health education does not go better with Coke. "Your letter will be sent to Dr. Douglas Henley, Chief Executive Officer of the AAFP." " The chains, nevertheless, stated that some consumers chose to replace the company's products with juices and drinks which are considered healthier, instead of opting for rival brands. In addition, they implied that the mention of the gases' origin - a pesticide producing company - increased health awareness among consumers." "Armed with banners demanding "Climate Justice Now!" 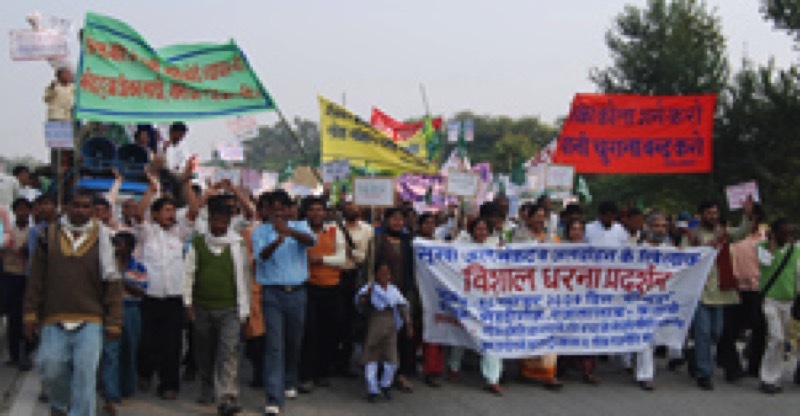 and "Shut Down Coca-Cola", over 2,000 villagers marched to the Coca-Cola bottling plant in Mehdiganj in India today demanding its closure. Villagers have accused the Coca-Cola bottling plant in Mehdiganj of worsening the water conditions in the area by over-extraction of groundwater as well as pollution." "Coca Cola officials sent employees to stores, quietly, without a fuss, seeking to pull hundreds of 1.5 liter bottles of the shelves, bottles that have a 'funny taste and bad odor'. The recall includes bottles with an expiration date of March 18 and 19 2010." "The recall of Coca Cola Israel products that began last week has been extended to include additional products. The Central Bottling Company is now asking the public not to consume Diet Sprite, Kinley Soda in glass bottles and canned Coca Cola of a specific expiry date." "Retailers yesterday reported a drop of 25% to 30% in sales of Coca Cola versus normal times, namely when the bubbles in the popular soda don't smell of sulfur...A survey by Panels Institute for Channel 10 News found that 93% of households had heard of the cola travails and 48% think the company is lying about the problem not posing a health hazard. Worse, from the Central Bottling'sview, 12% of respondents say they'll never drink Coke again." "Lawyers for the Bigio family, Jewish Egyptians whose property was seized by the Egyptian government in a 1960s program to rid the country of its Jewish population, are demanding summary judgment and a jury trial to establish damages against Coca-Cola for exploiting 'for immense profit' property that Coca Cola has been occupying since 1994 with the knowledge that the property was taken unlawfully from the Bigios. In a brief filed today in federal district court, the Bigios - responding to the Court's request for supplemental briefing - spelled out the extensive web of international laws violated by the Nasser regime's anti-Jewish campaign which included the nationalization of the Bigios' property in 1962." "Costco is no longer restocking Coca-Cola products in a shot across the beverage maker's bow on pricing, one that could have some significant ramifications." 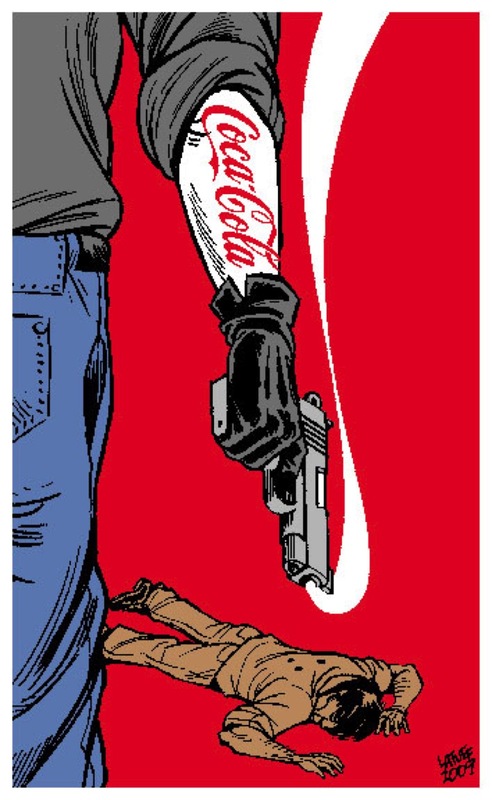 William Kietz; This image symbolizes Coke's violence against people and the environment. 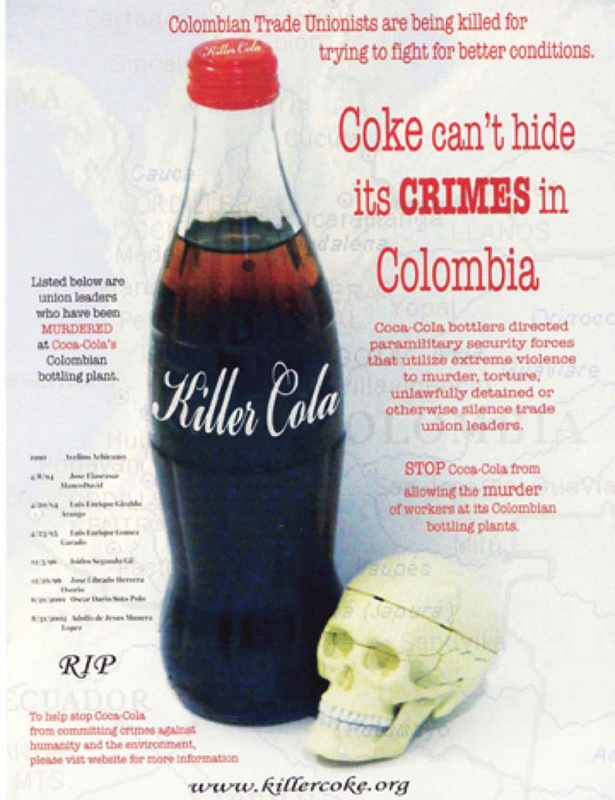 "In addition, Killer Coke [Campaign to Stop Killer Coke] claims that many of the Colombian paramilitary troops were trained at the controversial formerly-named School of the Americas, now called the U.S. Western Hemisphere Institute for Security and Economic Cooperation, in Fort Benning, Georgia." "In accordance with a nearly forgotten GM resolution dating back to the 1980s, the General Meeting is supposed to review product boycotts annually. 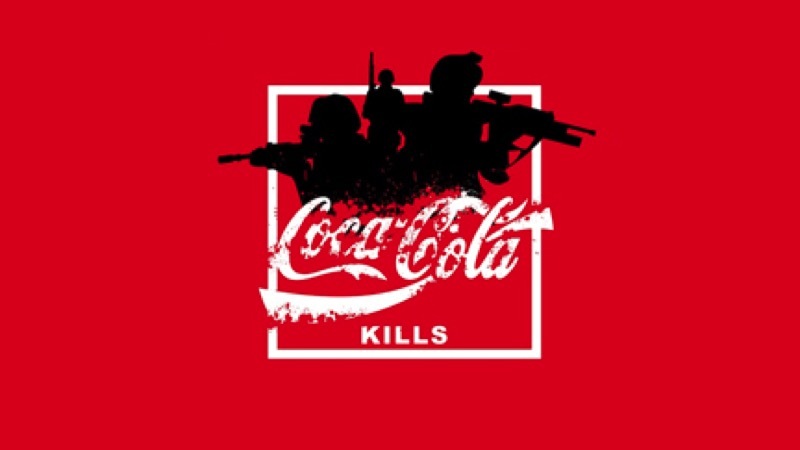 Catching up for lost time--nearly 20 years of it--the meeting reviewed current boycotts, learning that there is only one currently in effect, begun in 2004 against Coca-Cola. Coop member Lew Friedman, editor of the Stop Killer coke newsletter, explained that all of the reasons for the boycott still exist: violence against union workers and union leaders in Latin America, exploitation of water resources in India, use of child labor and other human rights violations. 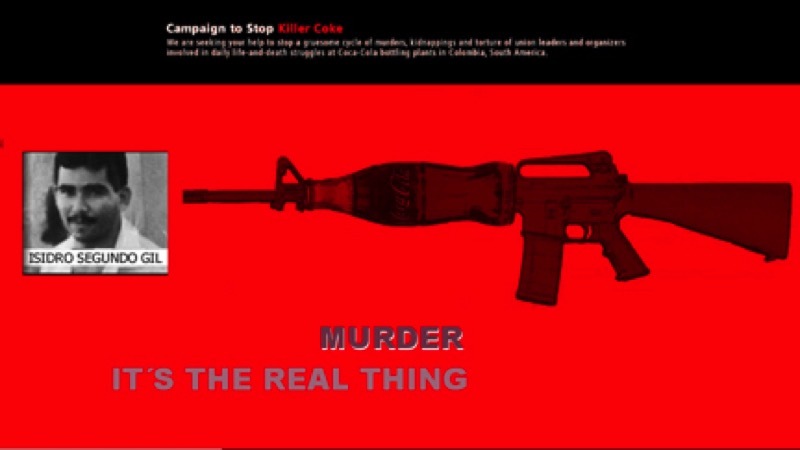 According to the website KillerCoke.org, seven union leaders at Coca-Cola's Colombia bottling plant have been murdered since 1990 and hundreds of others have been beaten or illegally detained by paramilitaries cooperating with the plant management. Friedman explained that among the institutions participating in the boycott are 50 colleges and universities. The boycott against Coke includes its other brands, Odwalla and Minute Maid juices, Nestea, Dasani and Fanta. "The General Meeting voted unanimously to continue boycotting Coca-Cola Company products." Click here or above to watch "The Coca-Cola Case." "An odd press conference took place last week in Post Office Square as a man claiming to be an executive at a soft-drink giant touted 'a new era for Coca-Cola,' in which its Dasani bottled water will be labeled 'Deception.' "
"The community of Mehdiganj in Varanasi, India will be rallying for climate justice and demanding the closure of the Coca-Cola bottling plant on November 30, 2009. The protests will highlight the disproportionate impacts of climate change being experienced by rural, agricultural and low-income communities, and challenge the Coca-Cola company's continued operations in the area that are worsening the climate impacts." "Nearly 20 Contra Costa County physicians resigned in disgust Wednesday from a national professional association because of its alliance with the Coca-Cola Co., which they said conflicts with their fight against obesity.
" 'I am appalled and ashamed of this partnership between Coca-Cola and the American Academy of Family Physicians,'" said Dr. William Walker, director of health services for the county.
" 'How can any organization that claims to promote public health join forces with a company that promotes products that put our children at risk for obesity, heart disease and early death?' "
"But some outspoken critics now wonder what those principles are. They call the partnership an embarrassing conflict of interest and say the venture will--and should--undermine the credibility of the AAFP, one of the leading family doctor groups in the U.S.
" 'For someone trying to lose weight, the first piece of advice is to cut out soft drinks, cold turkey,' said Marion Nestle, a professor of nutrition at New York University, who called for dissenting AAFP members to make their voices heard. 'Will the AAFP's educational materials make that point? I doubt it. Expect to see 'all foods can be part of healthful diets' and averted eyes in conversations about taxing soft drinks,' she said." "We here at the Coca-Cola Company feel your pain. Or rather, we don't, actually, but we like to say we do in marketing copy, because it makes us sound beneficent and honest, like a good corporate citizen, when in fact we're all about figuring out sinister ways to keep you wildly addicted to as many of our products for as long as humanly possible — which, if you drink enough of them, won't be that long at all." "The letter noted that soda is 'the only food or beverage that has been demonstrated to promote overweight and obesity.' But the signatories warned that the six-figure grant from Coca-Cola will prevent the doctors group from 'criticizing sugar-sweetened beverages in the strongest language.' "
"Something smells funny at Kathy Sommerkamp's flower shop on Hewitt Drive. 'It just stinks here,' Sommerkamp said. 'It stinks like we have cows.' The 'stink,' she said, is coming from the Coca-Cola plant just up the street. A spokeswoman for the Texas Commission on Environmental Quality said the plant recently started pre-treating waste at the plant." "WHEREAS, the AFT has protested and sought to change the unfair labor practices of many corporations currently included in TIAA-CREF's stock portfolio (e.g., Wal-Mart, Coca-Cola, Nike adn others) whose contractors nad sub-contractors routinely pay sub-poverty wages and suppress workers' rights to organize and collectively bargain..."
"Globally, bottled water requires the production of about 300 billion plastic bottles a year, of which maybe one in five is recycled. Transportation, packaging, distribution and dealing with the waste generates tens of millions of tonnes of carbon emissions - and for what exactly? About 40 per cent of all bottled water sold is simply municipal tap water put into plastic bottles by corporations such Pepsi (Aquafina) and Coca-Cola (Dasani) and then sold back to the public in plastic containers. "This is a peculiar form of double taxation for consumers. First, they pay to have a safe, high-quality public water supply, then they pay again to drink the very water they have already paid to purify. The difference is that, even with water charges, it's up to 10,000 times more expensive to drink bottled versus tap water." "Siptu has called for an international campaign against soft drinks giant Coca Cola over the company's decision to outsource 130 jobs." "The high powered committee appointed by the Kerala government to assess the damage and compensation on account of the functioning of Coca-Cola plant at Plachimada in Palakkad district, today held a sitting and received complaints from the public." "The ASA also said the drinks could not be considered to be "healthy" because each 500ml bottle contained 26% of the recommended daily allowance of sugar.
" 'Because we considered the ads made claims that were likely to be understood as referring to the nutritional and health benefits of the drinks, it was likely that, in conjunction with these claims, readers would infer that the range of drinks were "healthy",' said the ASA. 'Because the drinks contained a significant proportion of a consumer's RDA for sugar we concluded the ads were likely to mislead.' "
"In the quest for ever greater returns to investors, the company is taking on new debt to pay out cash. Debt-to-equity ratio now stands at close to 65%. Workers pay the cost. Investors certainly approve - the share price has climbed to 26 euros from a March low of less than 10. Irish workers, however, are not the only ones outraged by the actions of a company that dishes out gobs of cash to shareholders while slashing jobs. CCH workers throughout Europe and from Africa have expressed their solidarity by protesting to CCH management. So too ha the Coca-Cola Workers Alliance Steering Group, uniting major Coca-Cola Unions around the world, and union conferences in South Africa, Germany, and Canada. All have condemned the company's actions and called on CCH to reach a negotiated settlement with SIPTU." " 'The truth that refreshes' "
"In this feature length documentary, directors German Gutierrez and Carmen Garcia present a searing indictment of the Coca-Cola empire and its alleged kidnapping, torture and murder of union leaders trying to improve working conditions in Colombia, Guatemala and Turkey. "The filmmakers follow labour rights lawyers Daniel Kovalik and Terry Collingsworth and an activist for the 'Stop Killer-Coke!' 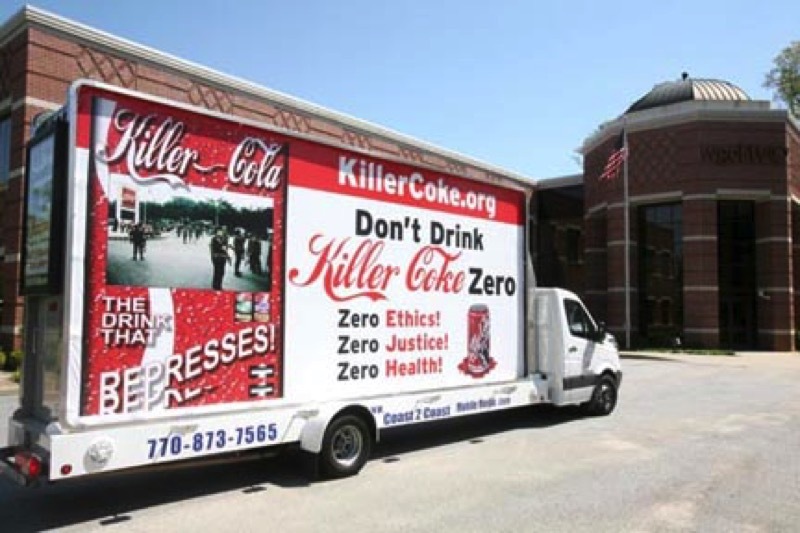 campaign (www.killercoke.org), Ray Rogers, as they attempt to hold the giant U.S. multinational beverage company accountable in this legal and human rights battle." " In 2007, facing growing opposition to its water management practices, particularly in India, Coca-Cola's CEO, Neville Isdell came up with a brilliant idea. The Coca-Cola company, he announced, will become water neutral, replenishing every drop of water they use, and therefore, as the suggestion went, Coca-Cola would have no impact of water resources around the world. Voila! Problem solved, a company using 300 billion liters of water annually would have no impact on water resources. Sustainability doesn't get any better than that. The only problem was that Coca-Cola knew that water neutrality was impossible to achieve." " 'The biggest thing is health concerns and our property values being zip,' said Stump, whose Paw Paw Road household is among more than 20 that stand east of a Coca-Cola Co. North America juice plant and whose well water has been tainted by the plant's juice wastes, which were sprayed on nearby fields." "It is ironic for Coca Cola to complain about Big Brother when the company has so thoroughly brainwashed the world. Coke and the other soft drink makers (this includes sports/energy drinks) have seduced Americans to double their daily intake of calories from sugar water since the late 1970s, fueling a tripling of obesity among youth 12 to 19, according to the Centers for Disease Control and Prevention..."
"Although it's a mystery as to how the Socialist Republic of Arkansas continues to survive with a soda tax its citizens have been paying since 1992. Not to mention the communist fiefdoms of Missouri, Tennessee and Virginia, which have similar taxes." "Even better than a new tax, however, would be to have the federal government withdraw all subsidies for corn because most of those soft drinks are sweetened now with high-fructose corn syrup, not sugar. We are using taxpayer money to underwrite the fattening of America, which is absurd." "I recently toured the Coca-Cola center in Atlanta. The marketing glitz was beyond belief. It is no wonder that half the world is now addicted to sugary beverages. If this same marketing genius had been used to promote healthier foods and beverages, we wouldn't have to deal with the current obesity epidemic or its ensuing health care demands." "I remember sitting in my high school biology class in 1993 and learning about the evils of soda. Unlike today's crusade against sugar, however, the health risks that were highlighted for me included the high phosphorus and acid content of all sodas. The phosphorus in carbonated beverages leaches calcium from our bones, increasing risk for osteoporosis, and the acid in soda can erode tooth enamel." "SIPTU claims Coca Cola management has rejected a Labour Court recommendation aimed at ending a six-week dispute at the company's Irish operation." "About 130 workers have been on strike over plans to outsource jobs in its warehousing and distribution centres. Yesterday, about 50 strikers staged a protest at the headquarters of Coca-Cola Ireland in Dublin." the vagabond, a free non-profit Melbourne, Australia, online magazine. "Groundwater levels in Kala Dera, the site of Coca-Cola's controversial bottling plant in India, have plummeted 5.83 meters (19 feet) in just one year between May 2007 and May 2008, according to government data obtained by the India Resource Center from the Central Groundwater Board. Such a precipitous drop in a single year is unprecedented and has never been witnessed in Kala Dera. The area of Kala Dera has also been declared a drought area by the government last week, adding to the water shortages in the area. Adding further to the severe water crisis as a result of dropping groundwater levels and drought are Coca-Cola's bottling operations. The company reaches peak production capacity in the summer months - using the most amount of water - exactly when the water shortages for the community are the most pronounced." "Regardless of whether it is the high or low production season, a significant body of subcontracted or dispatched workers--who face frequent wage arrears and even cutbacks on their pay--exists in Coca-Cola's Chinese factories. "Dispatched workers are employed by agencies, which send them to fill 'temporary, supporting or replaceable positions,' according to Article 66 of China's Labor Contract Law. Referring to the Implementing Rules for the China's Labor Contract Law, effective September 2008, it further stipulates that companies shall not use dispatched workers for more than six months, otherwise, they must sign full labor contracts with them. "(1) Coca-Cola apologizes publicly to all four affected students, who have safeguarded their legitimate interests in accordance with the local law but were insulted and assaulted. "(2) Coca-Cola pays for Xiao Liang the injured student-worker's medical fees. "(3) Coca-Cola Hangzhou bottling plant signs contracts directly with all laborers dispatched from Zhi Qiang and many other agencies. "(4) Coca-Cola converts all its subcontracted workers into full time employees within a reasonable time frame. "(5) Coca-Cola invites the Coke Student Concerned Group, SACOM, and credible not-for-profit labor organizations to organize in-factory labor rights training program for all workers who produce goods for Coca-Cola in China." Environmentalists and small businesses applauded a decision issued on July 19 by Federal District Court Judge Deborah A. Batts that will allow most provisions of the "Bigger Better Bottle Bill" to go into effect immediately, and the bottled water expansion to take place in October. In April, lawmakers updated New York's Bottle Bill as part of the state budget for FY 2009-2010. While the order gives bottled water companies a court date of October 22nd to show that they might need more time to comply, the decision notes that Nestles had already said it could comply by October 1st, 2009, which is when Connecticut's bottled water expansion goes into effect. The decision stated that "it is the Court's expectation that Plaintiffs...are actively working to achieve compliance with all aspects of the Bottle Bill." The American Littoral Society and other environmental groups praised the Attorney General's office for its handling of the case.
" 'It's just bad public policy,' said John Pierce, a spokesman for New Yorkers for Real Recycling Reform, a coalition of large and small businesses including convenience and grocery stores. 'It doesn't make sense from an environmental standpoint because it ignores most of the problem." That is seconded by Scott Vitters, global director of sustainable packaging for Coca-Cola, who said, 'To us, it's a 20th-century solution for a 21st-century problem.' "
"A request to Paw Paw Township from Coca-Cola North America to provide public water to nine homeowners whose wells had been tagged as having' potential water contamination from juice waste that Coca-Cola had sprayed on fields behind their facility was the hot topic of the night at the Township's Tuesday evening meeting. "Several residents from the specified homes attended the Township meeting asking board members "not to jump and take action too quickly in regards to Coca-Cola's proposal to extend, the public water system to them.
" 'Find out if this is what we' really want before agreeing to this,' said Brian, Stump. 'We would also like the Township to look at the whole picture and not just focus on the nine homes identified as being on Paw Paw Road and Hidden Lane. There are many more residents affected by this and maybe more to come as the plume continues to expand.' "
" Paw Paw residents experiencing well water contamination are moving forward with a lawsuit against Coca-Cola North America. Robert Bowcock, chief investigator for environmental crusader Erin Brockovich, held his second town hall meeting in Paw Paw Monday night. Bowcock, stepping in for Brockovich, whose scheduled appearance was canceled due to illness, announced that the Brockovich group now represents people from the area. He said that with the law firm Weitz & Luxenberg, P.C., of New York, they would be filing suit against Coca-Cola for groundwater contamination. The contamination is allegedly caused from the spraying of juice waste on fields located behind the Paw Paw facility. Juice waste sprayed on fields in large quantities can strip metals from the soil and make them soluble in groundwater." Acting on a recommendation from the Michigan Department of Environmental Quality (MDEQ), Coca-Cola North America has approached the Village of PawPaw with a request that the Village (at Coca-Cola's expense) connect nine residents along Paw Paw Road and Hidden Lane to the Village's water system. According to Village Manager Larry Nielsen, MDEQ felt that connecting to the village water system. was the best remedy for those residents, with wells tagged as having potential water contamination from juice waste that Coca-Cola had sprayed on fields behind their facility (a standard practice in the food processing industry). For the last 20 months, as a precautionary measure, Coca-Cola has been supplying these residents and others with bottled water. On June 15, Coca-Cola representatives met with Paw Paw Township and Village officials to discuss options that could be used to accomplish the connection. Currently the Township does not provide water to its residents and it may opt out from taking on these nine residents as customers to avoid becoming a MDEQ regulated water system. Should that be the case, an agreement between the Township and the Village could be developed to allow the nine properties to become Village customers instead of Township customers. According to Nielsen, Coca-Cola would be contacting the nine property owners regarding the proposal..."
Once again Coca-Cola hands itself, or rather its family, an award. This time The Coca-Cola Company presented its "Living the Values" Award (LVA) to Atlanta-based law firm King & Spalding L.L.P. How is this an award to itself? Simple research on the Internet will come up with the fact the Coca-Cola board member and former Senator from Georgia Sam Nunn is a retired partner at King & Spading. "...We counsel non-union clients on how to remain union free, and we represent clients in union organizing campaigns and unfair labor practice cases. We have also advised clients with respect to decertifying incumbent labor unions, and have had a number of successful decertifications. We often represent clients in collective bargaining, advise clients on contract interpretation issues, and represent clients in arbitration proceedings pursuant to their collective bargaining agreements. We also actively work with clients facing work stoppages, including training management employees, obtaining injunctive relief where appropriate, and advising clients on replacement of striking workers..."
Under "Preventive Advice and Training" King & Spalding states: "We also conduct training for all levels of employees from executives to staff. These training sessions include: The Manager's and Supervisor's role in Maintaining Union Free Status..."
Some of the clients that King & Spalding have represented include Brown & Williamson Tobacco Corp., The Coca-Cola Co., Chevron, Dow Chemical, ExxonMobil Corp, GlaxoSmithKline, Lockheed Martin Corp and SunTrust Banks, Inc. It should also be noted that in 1993 Nunn was a leader of the Senate's drive to keep openly gay people out of the military by taking the press on tours of showers and submarine quarters and firing two staff members who were gay. Although he now supports a review of the "Don't Ask, Don't Tell" policy, he still takes no position on the issue. So once again, The Coca-Cola Co. shows its antipathy for the labor movement and its employees in honoring Sam Nunn's anti-union law firm, King & Spalding. "A university student who got a temporary job at Coca-Cola this summer through an employment agency is taking the soft-drink bottler to court, after he was beaten by staff members at the agency. He is alleging that Coca-Cola showed poor management by hiring agencies that exploit workers. He said he was beaten by staffers at the agency after he demanded pay for his work at Coca-Cola. "Along with three other university students, the 21-year-old student surnamed Liang from Tianjin was sent to Zhongcui Food Co Ltd, a Coca-Cola bottling factory based in Hangzhou, after signing a contract with the Deqingzhiqiang employment agency in July this year. The students' summer jobs were actually part of an undercover project to investigate the working conditions in Coca-Cola's plants." Millions of Americans prefer bottled water over tap. But, as Kelly Wallace reports, a new congressional report indicates there is little evidence as to what is actually inside those bottles. Katie Couric questions how much Americans know about the bottled water they drink. Researchers say tap water is often as good as the water that costs two dollars. "What Thomas discovers is shocking: According to workers and human rights organizations, Sinaltrainal, after more than a decade of union-busting attacks and intimidation by paramilitaries allegedly hired by the Coca-Cola plants, is struggling to survive." "...he writes, the iconic white-and-red ribbon is a slick PR blindfold for child labor, union crackdowns and even violence, all to protect cash flow and the supply chain...The company, Thomas contends, looked the other way as some bottlers in Colombia and elsewhere intimidated and attacked union organizers, who 'walk with a gravestone' on their backs. Pressured to audit Colombian plants in 2005, Coke helpfully noted a substandard number of fire extinguishers at one, but didn't address the charges." Advertising Age, "Ad Council to Honor Coca-Cola Chief: Muhtar Kent to Receive 56th Annual Public Service Award"
"The Ad Council has selected Muhtar Kent, chairman-CEO of Coca-Cola Co., to receive its 56th annual Public Service Award. The award will be presented at the Ad Council's annual dinner Nov. 18 in New York." Each time Coca-Cola receives an award, a bit of research shows that a Coke executive is on the board of the company giving the award or Coke is a large contributor to the company. In the case of the Ad council, Coke is listed as a member of the company's President's Circle, contributors of more than $150,000. 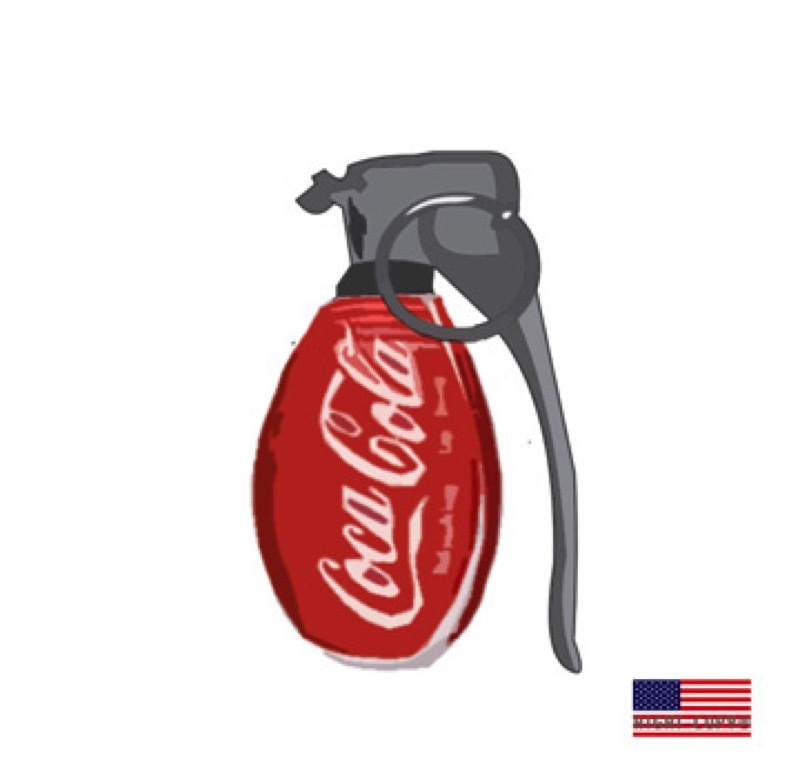 "Venezuela's Health Ministry said Friday it banned sales of Coca-Cola Zero because the company failed to declare that the no-calorie soft drink uses an artificial sweetener allegedly harmful to health. Health officials said tests show the cola contains sodium cyclamate. Coca-Cola Co. disputes that, saying the product sold in Venezuela uses different artificial sweeteners, Acesulfame-K and Aspartame. (see below re: aspartame)"
"Health minister Jesus Mantilla said the zero-calorie drink 'should be withdrawn from circulation to preserve the health of Venezuelans,' while the government investigated its ingredients which it said could be 'harmful'." Coke has used sodium cyclamate in its drinks in some parts of the world. While not allowed to use it in the U.S., the company was using the artificial sweetener in Mexico until about a year ago. However, replacing cyclamates with aspartame is not a solution (see the piece by Betty Martini below). "Coca-Cola has reformulated the Mexican version of Coke Zero, removing a controversial artificial sweetener that is banned in the U.S. and caused an outcry from consumer advocates in Mexico. "The company said the change will give the diet drink a taste closer to that of Coca-Cola Classic and had nothing to do with concerns over sodium cyclamate [the usual Coke Co. denial], a sweetener banned in the U.S. 39 years ago by the Food and Drug Administration after lab findings suggested it posed a cancer risk." "...That word is aspartame, and [Coke's] only recourse is denial, denial, denial, though every ad and commercial builds higher the scaffold upon which Coke shall surely hang. Reality is in that twisted Diet Coke can. It's poison. It's killing the unborn, raining tumors and seizures on the population, destroying children, incapacitating workers, mimicking MS, erasing memory and blinding. Inexorably Diet Coke visits a plague of 92 symptoms listed by our FDA on a secret report they'll never show that names diet soda as the top cause of aspartame disease. And yes, Death was one of the 92. "Diet Coke is poison! And it's addictive; some victims drink several liters a day and keep it on their nightstands. If Coke changes the formula to remove aspartame the world will heal and the surge of hatred and vengeance by the disabled and bereaved shall certainly destroy Coca Cola. "The poison in Diet Coke is aspartame. As a member of the National Soft Drink Association, Coke opposed FDA approval of aspartame for beverages. Their objections, running to several pages published in the Congressional record of 5/7/85, said aspartame is uniquely and inherently unstable and breaks down in the can. It decomposes into formaldehyde, methyl alcohol, formic acid, diketopiperazine and other toxins. In a test on 7 monkeys 5 had grand mal seizures and one died, a casualty rate of 86%. "Coke knew; and knowing, broke their good faith contract with customers, a breach shown by their English plot to program vending machines to kite the price with the temperature. Dissatisfied with selling flavored sugar water plus phosphoric acid, they switched to pushing an addictive formula called "Diet". Addiction multiplies consumption, so Diet Coke soared off the sales charts, spreading obesity. We're fatter because aspartame suppresses serotonin and makes us crave carbohydrates." "Citing both financial and environmental reasons, Gov. David A. Paterson signed an executive order on Tuesday directing state agencies to phase out the purchase and use of bottled water at government workplaces. "The order will gradually terminate the use of state money for the purchase of single-serve water bottles and larger, cooler-sized water bottles. Each executive agency will have to provide alternative water sources, like ordinary tap water fountains and dispensers." "Today, the 'Campaign to Stop Killer Coke' at the University of Massachusetts will be holding a boycott against all Coca-Cola products. "The campaign at UMass is a nascent organization beginning to gain ground among students. Boone Shear, a member of the organization and an anthropology doctoral candidate at UMass, said 'the boycott is meant as a symbolic beginning and as an informational, consciousness-raising exercise.' 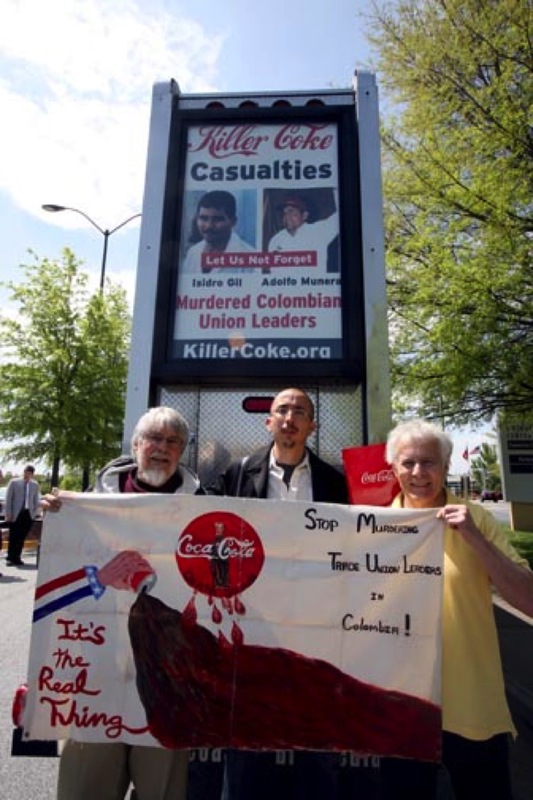 "
"After reviewing the ILO report, the UCATS executive council has come to the same conclusion as the advocates of the Coke ban--it does not address the murders of union activists at Coke's bottling plants in Colombia. On March 11th, the UCATS Executive Council voted to re-affirm our 2005 resolution to boycott Coca-Cola products for our member events and we call upon our members to avoiding purchasing Coke products until further notice." 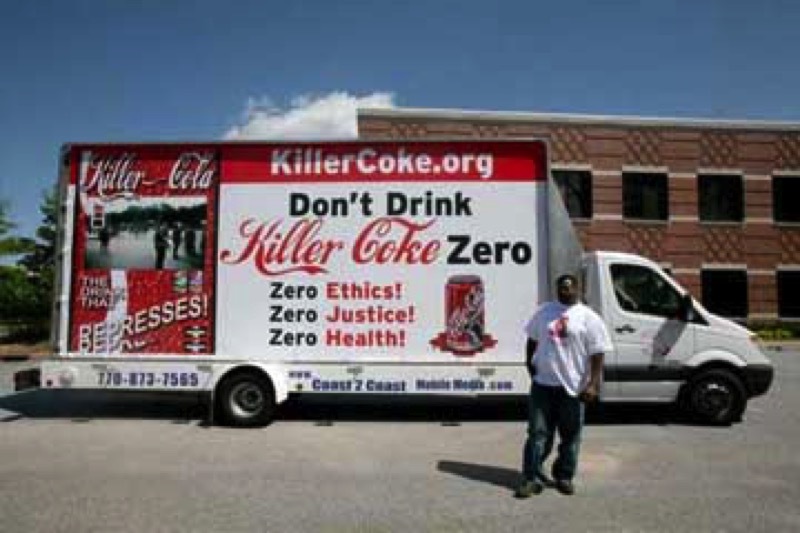 ThIS Killer Coke mobile billboard was created for the 2009 Coca-Cola annual shareholders meeting. It traveled throughout Atlanta for five days playing David Rovics's "Drink of the Death Squads." The memorial on the back of the truck was for Isidro Gil and Adolfo Munera, both murdered by paramilitary thugs working with plant managers in the Coke bottling plants. This video was taken at a busy intersection north of Atlanta. 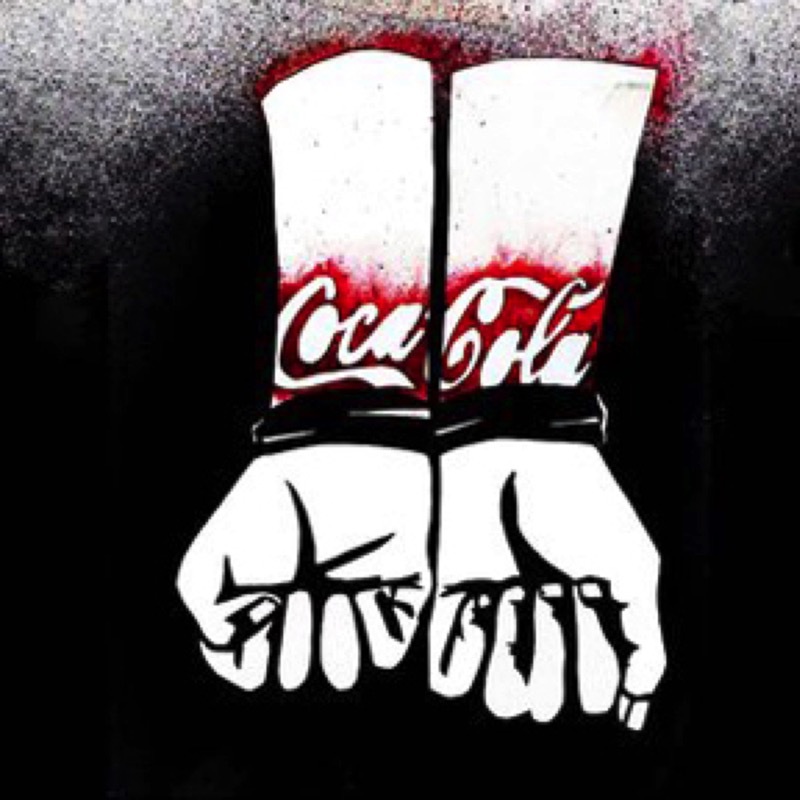 "The Coca-Cola Company denied and protested emphatically charges of dangerous work conditions and human rights abuse in China at its annual stockholder's meeting today in Georgia...The heated exchange between Ray Rogers, director of Corporate Campaign Inc was a fire storm as shareholders considered whether to vote yes or no on a proposal by a shareholder connected with Harrington Investments of Napa, California. This organization has pressed for shareholder advocacy over a twenty five year period. It claims to have persuaded 120 publicly traded corporation to expand economic, social and environment accountability and responsibility. Another stockholder was evicted from the meeting hall of an estimated one thousand in attendance after he refused to stop propelling charges against Coca-Cola management." "As in previous years, the gathering drew protesters. They were kept about 150 yards from the front entrance of the conference center. 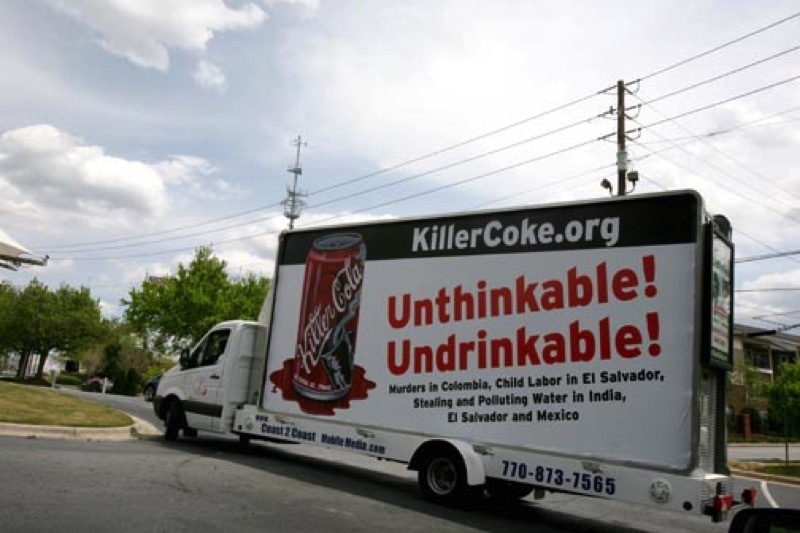 A rolling billboard attached to a truck with the words, "Unthinkable, Undrinkable" on the side passed through the parking lot every few minutes. "Inside the meeting, a few hundred shareholders gathered. Several addressed the board, some of them vocal, yelling questions past their allotted time and attempting to disrupt the meeting. The critics have been concerned about Coca-Cola's human rights record and business practices abroad." We had a great experience working with David McGlory and his Coast2Coast Mobile Media (770-873-7565). As you see, his work was terrific, on time and very supportive of our campaign, wearing a Killer Coke tee-shirt and handing out our leaflets to all those asking. His excellent sound equipment playing "Drink of the Death Squads" attracted lots of attention. Website: www.coast2coastmobilemedia.com; Email: coast2coastdm@gmail.com Special thanks to David and Coast2Coast. "Activist shareholder Ray Rogers, who frequently attends Coke annual meetings, started the session by loudly raising questions about the company's human rights record. Isdell pointed to internal and external reviews that showed Coke respected human rights. "Rogers was followed by a more agitated attendee, who identified himself as a "shareholder from New York" and criticized the way the board of directors was composed. After he failed to yield the floor to Isdell, security guards escorted him from the room. Many in the audience applauded his ejection." "Hier werden nur ein paar gruende genannt warum Cola boikottiert werden soll!" " 'We know that some people will always disagree and we respect that, but we know this deal is a great opportunity for Innocent,' says Dan Germain, the head of creative at the smoothie company that last week accepted �30m from Coca-Cola to become a shareholder. In fact, from the comments on Twitter, Facebook and Innocent's own blog, it is hard to find anyone who agrees with the deal." "Within hours a new Facebook page was set up dedicated to boycotting Innocent. 'Inevitably, greed turned the fruit sour,' reads the group's description..."
"Claims Coke will not make children fat or rot their teeth have landed Coca-Cola in trouble with Australia's consumer watchdog, which Thursday ordered the soft drink company to correct its advertising." "The Australian Dental Association has called on the company [Coca-Cola] to withdraw the full-page ad - which busts myths that fizzy drinks are unhealthy - saying the information was either ambiguous or wrong. The association took exception to the claim that the ad busted the "myth" that Coke rots teeth. "Its president, Dr John Matthews, said: 'We shouldn't rely upon Coca-Cola for giving us dental health advice. They have underestimated the problem and put a spin on it. Most people know Coke is bad for them but they continue to do it so I don't know why Coca-Cola feels the need to do this.' "
"China rejected Coca-Cola's bid to buy top local juice maker Huiyuan because it feared the U.S. multinational could abuse its position across the whole soft drinks market, an official said in remarks published on Wednesday." "As a principal sponsor of FIFA, Coca-Cola is keen to trade in on the World Cup's image of fair play and good sportsmanship. But many believe its business practices make a mockery of this reputation. "For thirsty fans at the World Cup, there's only one choice of soft drink available. Whether it's Coke, Sprite or Bonaqua, all the brands on sale belong to coca-cola. "Many of these drinks are produced in India, where Coca-Cola's business practices have elicited widespread condemnation. 'The coca cola factory ruined my life,' despairs one farmer. Producing 0.33L of coke requires 1L of water. In some villages near cola factories, water levels have dropped by 60m. Harvests have fallen by more than 40% because there is not enough water to irrigate fields. But Coca-Cola denies all responsibility. 'We are not the problem', states spokesman Rajiv Singh. 'There are simply too many people living here who are wasteful with water.' Coca-cola also stands accused of pollution and union busting. Many workers in their factories receive around 50 cents for a 12 hour shift. They have no unions and sometimes receive no compensation for injuries sustained. As Bhagwab Das Yadav states: 'All we want is for coca cola to respect India's labour laws.' "
"As the summer of 2009 approaches, the village of Kala Dera in north India is bracing itself for yet another season of acute water shortages - thanks largely to Coca-Cola. Coca-Cola should never have located its bottling plant in a drought prone area which had already been declared as overexploited by the government. It was malfeasance on the part of Coca-Cola to locate its plant in such a water-deficit area, and it was a grave mistake on the part of the Indian government to allow the plant to be located in Kala Dera." "The Federation of Canadian Municipalities says officials should ban the sale of bottled water at public city events or in civic buildings. Federation President Jean Perrault said at a meeting in Victoria Saturday that the civic advocacy group has adopted a resolution calling for regulations on the sale and purchase of bottled water, the Canwest News Service reported Sunday." Sign a petition to ban bottled water in your U.S. state's offices and events. "Many of theses drinks are produced in India, where Coca-Cola's business practices have elicited widespread condemnation. 'The coca cola factory ruined my life,' despairs one farmer. Producing 0.33L of coke requires 1L of water. In some villages near cola factories, water levels have dropped by 60m. Harvests have fallen by more than 40% because there is not enough water to irrigate fields. But Coca-Cola denies all responsibility. 'We are not the problem', states spokesman Rajiv Singh. 'There are simply too many people living here who are wasteful with water.' 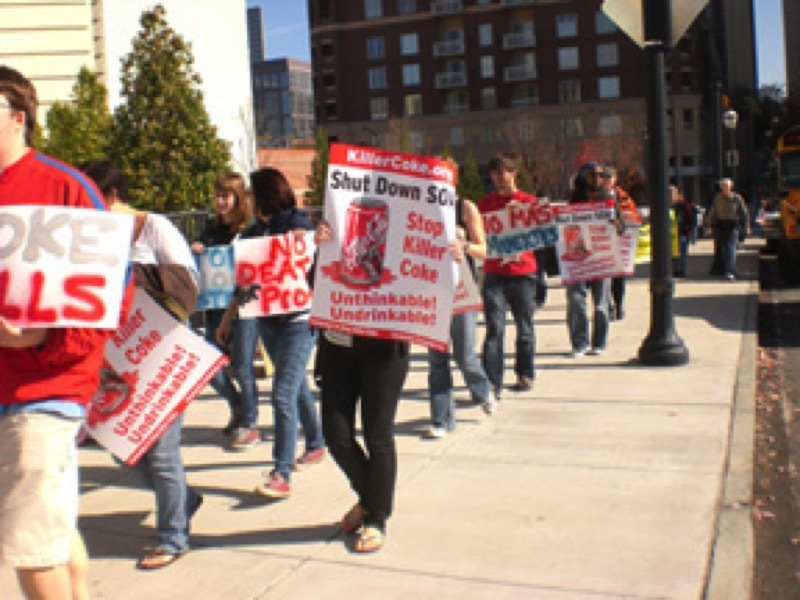 Coca-cola also stands accused of pollution and union busting. Many workers in their factories receive around 50 cents for a 12 hour shift. They have no unions and sometimes receive no compensation for injuries sustained. 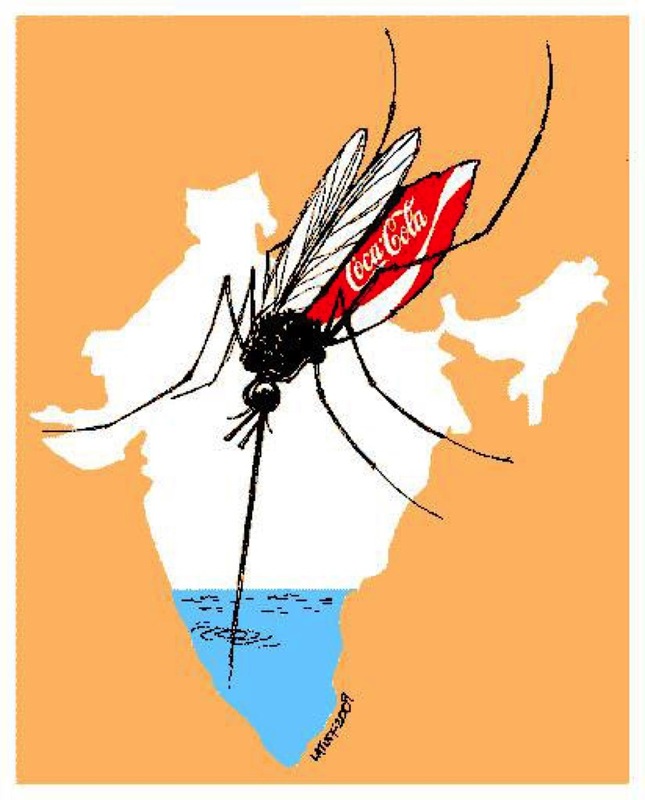 As Bhagwab Das Yadav states: 'All we want is for coca cola to respect India's labour laws.' "
"Last month, key activists from Kerala who have succeeded in shutting down one of Coca-Cola's largest plants in India wrote an open letter to Mr. Shashi Tharoor deploring his role as an advisor to the recently formed Coca-Cola India Foundation. What followed was a response from Mr. Tharoor which confirmed that he is not aware of the facts surrounding Coca-Cola's operations in India. Mr. Tharoor - former UN Under Secretary General - has recently confirmed (at a Coca-Cola sponsored lecture, no less) his ambitions to become an elected member of Parliament of India. Mr. Tharoor's letter has evoked strong responses, including one from us." Hier werden nur ein paar gruende genannt warum Cola boikottiert werden soll! "But the book has the serious intent of redressing Coke's corporate crimes in solidarity with the working people and the activists he meets, people of "courage and tenacity" fighting for their human rights against the power and profits of a 'brown, fizzy, sugar water ... which is not something any of us really needs'." "Last night, 64 students barricaded themselves inside the third floor dining room of the Kimmel Center. The occupation was organized by Take Back NYU, an on-campus coalition founded around goals of increasing university transparency and accountability. By bullhorn, the group read a list of 13 demands that must be met by the university before TBNYU leaves the building. Demands include full disclosure of the university's endowment, investment strategy and operating budget, a reconsideration of the recent lift of the Coca-Cola ban, and tuition stabilization for all students beginning with the class of 2012. "A close partnership between a high profile company and a high profile conservation organization is naturally not without its risks, however we have conducted a thorough risk assessment both globally and locally. It is important to remember that this does not mean that Coca-Cola is perfect by any means, however we have carved out an ambitious work-plan that addresses a gigantic portion of their footprint..."
"How can you expect environmental organizations to promote your campaign when you let Coca Cola corporation greenwash their brand through your efforts? "This is an insult to all of the environmental organizations and activists who work so hard against corporations like Coca Cola - who do so much damage to our planet. "This is an insult to the people all over the planet who are exploited and oppressed under the crushing footprint of this corporation who has no regard for human life or the environment. "We regret that we must ask to be removed from the website as a participating organization. "We will participate in Earth Hour - however - we cannot promote the event with Coca Cola as your sponsor. "Please also remove my name. "We hope you will consider researching this corporations horrific human rights violations and vast environmental degradation and remove Coca Cola as your sponsor. "As Ronald Reagan loved to remark, 'There they go again.' WWF, the corporate-funded environmental giant often accused of taking greenbacks in return for greenwashing its corporate benefactors, has a new partner. WWF and the Coca-Cola Company proclaimed a "bold partnership" that has Coke paying WWF US$20 million. WWF touts the deal on its website. A full- page New York Times advertisement announcing the deal is headlined "This is our drop," a phrase that Coke has trademarked. For Coke, $20 million is just a drop in the bucket, a cheap fee for the PR boost from its WWF partnership. Other companies giving money to and receiving the blessings of WWF include Alcoa, Altria Group, Walt Disney Company, and dozens more listed on the WWF website..."
The World Environment Center awarded the 2009 WEC Gold Medal to The Coca-Cola Co. for "International Corporate Achievement in Sustainable Development. A little research indicates a WEC Vice Chair is Jeff Seabright, Coca-Cola's VP of Environment & Water Resources. Thus, this award is another scam like the Golden Peacock and numerous other awards given to Coke by organizations either with Coke policymakers on the board or with a large monetary relationship. And a scan of the list of past recipients show more examples of "environmentally responsible" corporations Exxon Corp and Dow Chemical. "Two new papers look at the presence of mercury in high fructose corn syrup (HFCS). An article in Environmental Health finds mercury in commercial HFCS. An IATP study finds mercury in common foods and beverages [including Coca-Cola Classic]." "An interview with the Campaign to Stop Killer Coke director, Ray Rogers. 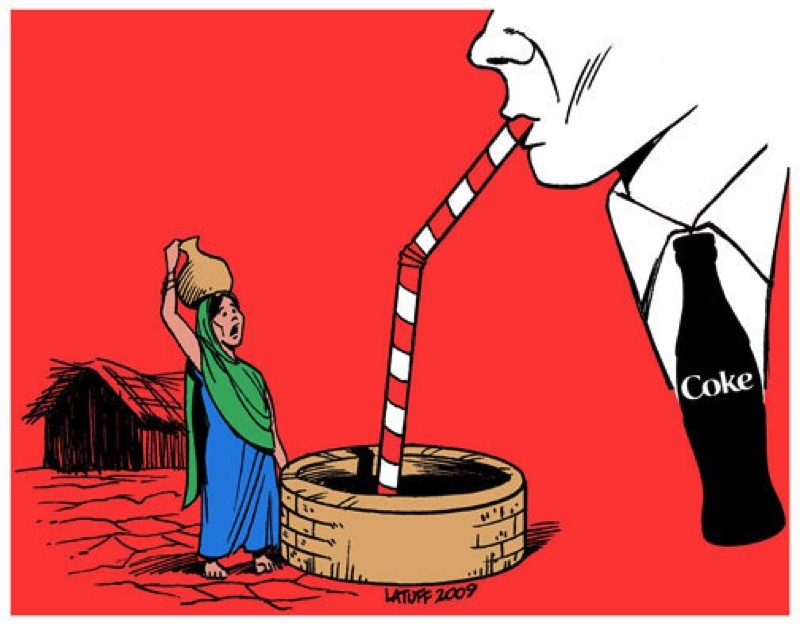 Coca Cola has been accused of human rights abuses world wide. The campaign was started to try and hold Coke responsible." 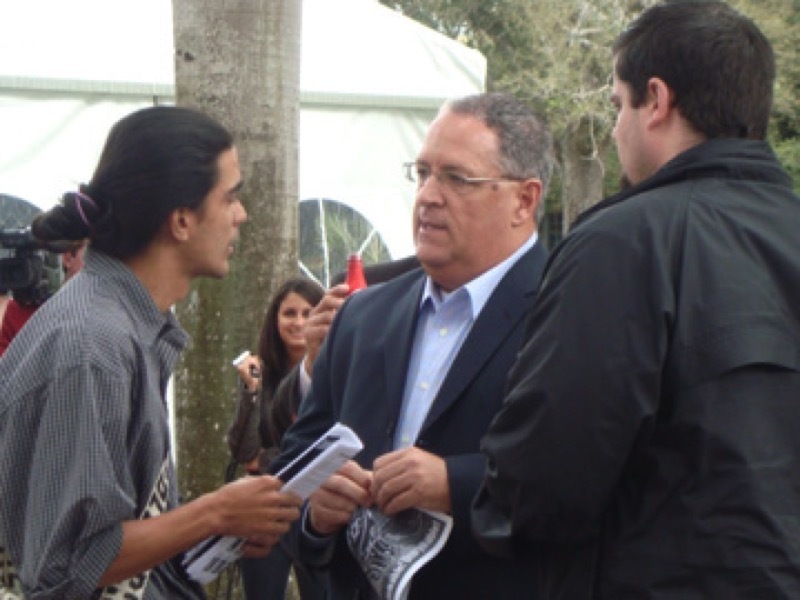 An email from the University: "Yesterday, the Global Business Forum ended with a luncheon at the University of Miami. At this forum, many CEO's were present — one of them Muhtar Kent, president and chief executive officer of The Coca- Cola Company. Kent oversees all operations of the business, including Bottling Investments. "We couldn't miss this opportunity to denounce the killing with impunity of the union members in the Colombian Coke bottling plants, so we went to this luncheon. We couldn't get to Mr. Muhtar, but we asked the president of University of Miami [Donna E. Shalala] if she knew about the assassinations of Coca-Cola union members in Colombia. Her silence was as cold as a dead body." The Maine Fair Trade Campaign has officially endorsed the UMaine Coke Boycott. The Maine Fair Trade Campaign is a coalition of 51 labor, environmental, human rights, faith, and community organizations working together to build a just, sustainable, and democratic local and global economy. The mission of the Maine Fair Trade Campaign is to oppose unjust, unsustainable international trade policies and to work for the creation of socially, economically, and environmentally just trade policies and a fair global economy. The purpose of the Maine Fair Trade Campaign (MFTC) is to educate, organize and mobilize organizations and individuals to work for the creation of just trade policies and a fair global economy that respects working people, family farmers, our environment, and our democracy. We forward this purpose through education, statewide organizing and coalition building, state and national legislative work and lobbying, and the promotion of local and global fair trade alternatives. The MFTC works to help make the connections between international trade and economic policies and their local impact on Maine workers and small businesses, Maine's environment and Maine's democracy. In all of our work as a coalition, we do not take any actions that would injure member organizations in the coalition. "A nutrition advocacy group on Thursday sued the Coca-Cola Co., the biggest beverage maker in the world, over what it calls "deceptive" health claims about VitaminWater. "The Washington-based Center for Science in the Public Interest accuses Coke of selling what it says is basically sugar water by claiming it has vitamins that boost immunity and reduce the risk of disease." "Excellent documentary showing how dangerous artificial sweetner Aspartame is [Aspartame is the artificial sweetner used in Diet Coke]. From its history, to its effects this video is enough to shock anyone into really looking at their food labels next time they shop. Aspartame is a toxic food that came into the world as an investment By Donald Rumsfeld, while ignoring the deadly effects the tests showed. Take a good look at this video, it could save lives." "The Coca-Cola Company has recently come under fire by the Food and Drug Administration for its reluctance to disclose exactly what the "Plus" in Diet Coke Plus really means. For starters, the FDA isn't exactly thrilled with the concept of fortifying an unhealthy snack drink. Couple that with the fact that the amount of vitamins and minerals added to Diet Coke Plus remains somewhat vague, and it becomes clear why the FDA deemed it appropriate to step in."